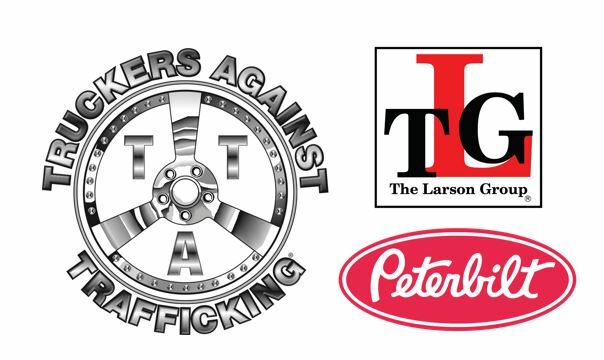 In recognition of Human Trafficking Awareness Day, The Larson Group Peterbilt announced that it has partnered with Truckers Against Trafficking to report criminal activity that may be occurring at active trucking locations at 15 locations across the Midwest. The Larson Group (TLG) reports that through taking part in the Trucking Against Trafficking (TAT) initiatives, drivers will be encouraged to learn about the signs related to human trafficking in public places as well as how to take the appropriate action when they suspect a crime is occurring or when witnessing a crime. Glenn Larson, President and CEO of the Larson Group reports that involvement with the TAT program will help the enormous volumes of drivers at TLG dealerships combat the issue of human trafficking as it relates to the trucking industry. TLG reports that it will make use of TAT’s materials and educational resources to inform drivers of the common signs of human trafficking and to dialogue to present to potential victims of trafficking if approached by them. Additionally, TAT and TLD report that one important practice in correctly handling human trafficking reporting potential cases to the National Human Trafficking Resource Center hotline rather than approaching traffickers directly. Thomas also added that truckers are the ideal addition to an anti-trafficking force, as their work often makes them present in areas where trafficking has been known to occur. The Larson Group reports that it encourages individuals interested in supporting Human Trafficking Month this January to post on social media using the #HumanTraffickingAwarenessDay hashtag.